Szymon Kuczynski, the Polish Skipper of a 6.36 metre-long yacht is set to secure a new world record for the smallest yacht to circumnavigate the globe non-stop with no engine, when he returns to Mayflower Marina, Plymouth this week. Szymon, who set sail from the Mayflower Marina on August 19th 2017, has spent over 260 days alone at sea on board his yacht ‘Atlantic Puffin’ whilst undertaking his adventurous sailing expedition. 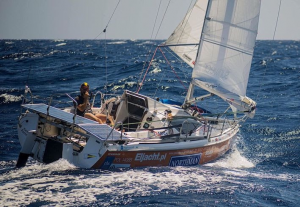 In an incredible feat of skill and determination the award-winning solo sailor has taken a classic sea route round the three famous capes of Africa, Australia and South America, with no outer medical or technical support. Szymon has been living in a space of only 4 square metres for nearly ten months and remarkably accomplished this trip without making any stops to ports. He is expected to arrive back at Mayflower Marina on Wednesday 16 May, 2018. Out of the ocean and into the Yard – meet Royal William Yard’s newest resident! A new family-friendly attraction has arrived at Royal William Yard where it is waiting to meet visitors. Emerging from the harbour to take pride of place on the lawn, the Giant Squid will be here to stay for the summer. This vivid-red, epic sea creature is a striking, acoustic installation by award-winning European art collective Moradavaga. Truly interactive, families can speak into the tentacles and eyes of the sea creature, which carries the sound into the centre of the structure. To further capture the imagination of visitors, families can hunt for the squid’s six friends by following a trail around the Yard.